CN Tower EdgeWalk — Not for the Faint of Heart! I’ll readily admit to a fear of extreme heights. 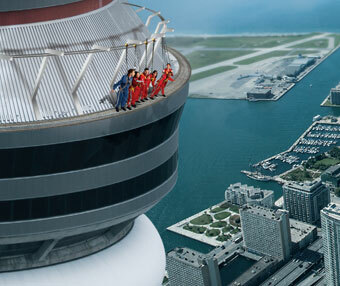 So contemplating the planned EdgeWalk attraction at Toronto’s CN Tower leaves me dumbfounded. As the rendering posted above shows, this new addition to the CN Tower’s offerings will allow adventurous thrill seekers the opportunity to walk along the outer perimeter of the Tower 1,168 feet (365 meters) — that’s about as high as a 116-story building — above the ground with no handrail and secured only by a harness attached to an overhead guide rail. Playing to people’s fascination (or maybe a kind of love-hate relationship) with pushing the edge when it comes to heights apparently makes good business sense. Similar attractions that come to mind include the elevated perimeter walk at the Macau Tower Skywalk in Macau, China, the Las Vegas SkyJump, and the astounding 4,000-feet (1,200 meters) high Grand Canyon Skywalk, to name just a few. Even now the existing features of the CN Tower include a glass-floor observation area and a glass elevator ascending the Tower. The EdgeWalk is scheduled to open August 1, with tickets going on sale June 1. For my part, I’ll look forward to any videos or photos from actual EdgeWalkers but I don’t expect to be in any of them. More information is available from the CN Tower site.